For many it’s a famous rose. It’s pretty, easy to fold and anyone should know how to do one. Be it for your sweetheart, for you or just for show it is a lovable rose. You can find step by step instructions in Oribara Web, in the Rose for Peace project. The Rose for Peace is because this is a Professional High School Project in Fukuyama, a city in the Hiroshima district. Getting the hint? You can get more info about the city in the Fukuyama City site (english). As for the Rose, the page is in japanese but you really have step by step photos and in some “tricky” steps there is a video. All you need to know: yellow line is for valley folds, green line is for mountain folds, blue line identifies the previous creases. Easy? It gets easier; 2 nice buttons take you for the next or the previous step. You have no excuse for not doing a rose! My advice: the first rose should be done with 15×15 or 20×20 paper. After that you can change sizes and go to 10×10. The smaller I’ve done is 7.5×7.5 and it’s a bit too small. It gets somewhat harder to fold. A 15×15 paper gives you a rose of 4.5×4.5×3.5 (width x length x height). This entry was posted on 2007|03|19 at 10:48 and is filed under origami. You can follow any responses to this entry through the RSS 2.0 feed. You can leave a response, or trackback from your own site. I loved your website. Thank you for inspiring me to try the K-rose. these tiny roses. At the time, I just admired them, but now, I am inspired to try it. I work mostly with teachers of young learners from Kindergarten to grade 5 and sometimes middle school. I am always looking for models that they can adapt to the classroom and that are easier to manipulate. how do you make the base leaves??? also how do you make a stem with leaves??? Thank you so much for this… I usually can’t fold a simple airplane (lol) but following these diagrams I made the k-Rose!! awesome! hm, with a little bit of internetting you can easily land the english step-by-step instructions to the rose! I have tried many other site/instructions but this time is a good one. I’ve been trying to find an alternative to fresh flowers for my wedding centerpieces. I really hate silk flowers and have been trying to come up with something as “filler” for what I have already purchased. I finally thought that maybe origami would be the perfect fit. I have never seen this rose before, and now I’m hooked! It will be perfect. I can make many of them in our wedding colors (dark red and aqua) and accent colors and make them big or small! I tried it out first to make sure I could do it, and the instructions were great! They were a little tricky since I didn’t have paper clips handy, but I’m so excited to get working on this. Thanks so much! OMG!! I have been looking for good instructions on the k rose for hours! finally a good one! i was sooo surprised at how good my rose came out, and how i could actually follow the steps! this is amazing. Muy bonito!!! Les invito a visitar mi blog. Yo también colapse esa rosa. dont know if this is any help, but there’s a ton of stuff on this site, the one you’re seeking may be here. I made one of these with some silk lined paper and I’m asking someone to a school dance with it, wish me luck! 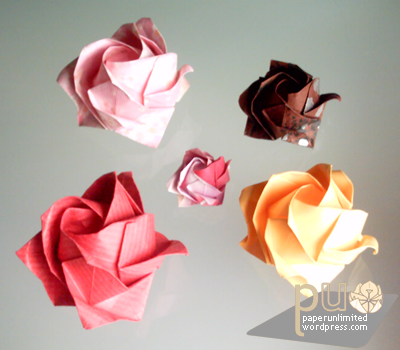 really the best origami tutorials….thank-you much!